But if you’re interested, here are some of the best transparent bottom inflatable boats available on the market right now. Axa Marine offers clear-bottom inflatable boats in various sizes. 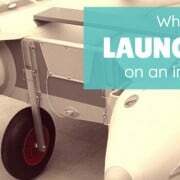 Like traditional inflatable boats, they have separate air chambers, which have a safety valve to prevent over-inflation. A one-way drain valve plug is also installed to make deflating a lot easier. These boats also have an all-around grab rope and rubbing strakes; these strakes prevent easy-wearing out of the PVC fabric often caused by rowing. They also feature stainless steel D-rings for easier towing with a lifting handle for the front bow. Spare rope is also available for anchoring. These transparent inflatable boats are accentuated with a heavy-duty marine plywood transom, which can efficiently support an outboard motor. Despite its transparency, the hull is made from durable and high-performing rigid, lightweight material. The bottom of the boat also has an added extra layer of fabric to ensure stability and sturdiness. Axa Marine transparent inflatable boats are manufactured from an extremely durable PVC fabric and are offered in an array of colors. They also allow customization of the bottom: choices are a windowed clear-bottom or an all clear-bottom boat. The clear bottom version is made out of indestructible polycarbonate plastic. 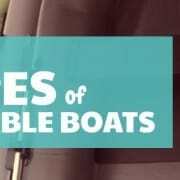 Upon purchase, the inflatable boat comes with aluminum oars, a repair kit, one bench seat, and a high-volume foot pump. Lomac features windowed transparent bottom inflatable boats which allow riders to view the underwater surroundings conveniently. Unlike Axa Marine inflatable boats, these boats have a more simplistic design; they come with a few rope handles, oar holders, and a transparent hull. The tubes are constructed with Hypalon fabric, which is known to be far sturdier than PVC fabric. The transparent flooring is also constructed with a transparent limber board, more durable than glass. And lastly, the transom is made from Marine wood, a widely used material for inflatable boats. 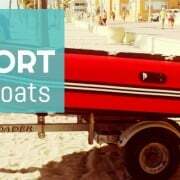 Aside from that, the transom supports an outboard motor, which makes it perfect for cruising along the seaside. These boats are constructed with PVC fabric. However, its highlight is its sturdily-constructed transparent flooring which is made from hardened 5 mm thick Polycarbonate material; this is the same material as motorcycle windshields and police riot shields. For added durability, it also has double layers of PVC fabric at the bottom of its tubes. 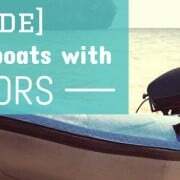 It also features a Marine wood transom, suitable for outboard motors. The chambers are also easily inflated, with a one-way drain valve which enables easy deflation as well. 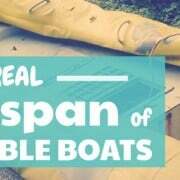 The entire clear bottom boat package also includes a pair of aluminum oars, a repair kit, one Marine wood bench seat, and a high-volume foot pump. 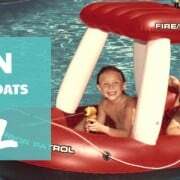 There are also transparent bottom inflatable boats for kids that are available on the market. These are perfect for underwater viewing for your young sailors! Remember to never to let your young one go out on the water alone. Adult supervision is a must near water, as are life vests for kids. The Aquavue Voyager by Sieco Design has a clear bottom viewing window, which allows your little one to view underwater scenery without getting wet. 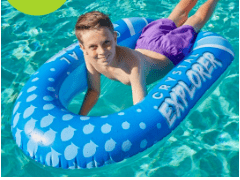 It also features safety handles and a pull rope that allows convenient pulling in the pool or along shallow waters on the beach. The chamber is also easily inflated, suitable for both electric and hand pumps. In fact, you can even use your mouth to inflate this small raft! Its valves are also equipped with a backflow prevention feature, which secures air inflation. It also has a quick release valve that allows quick deflation that can take as fast as 60 seconds! 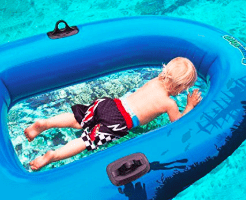 The Crystal Explorer Clear View Bottom boat is perfect for pool activities in the pool. The all-clear bottom of the boat allows the rider to view underwater surroundings clearly. It also has an easily inflated chamber like the Aquavue Voyager, that is compatible with both electric and hand pumps. It has a compact design and is easily deflated as well. However, the Crystal Explorer relatively lacks safety features like handles and pull ropes. Therefore, it is only advisable to be used in pools.